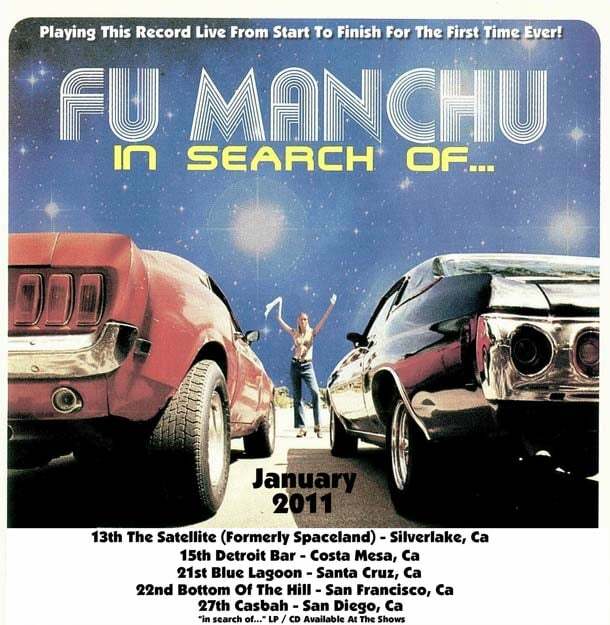 Tonight FU MANCHU plays The Satellite along with their old friend Clifford Dinsmore and his band DUSTED ANGEL (who we wrote about soon after birth), maybe more familiar to some of you from his run in BL*AST. The flyer tells the story and with this show being the first of the tour, it really will be the "First Time Ever" this seminal album is played straight through live. If some of you are thinking, "What about a ticket contest? ", we have the same question. We were hopeful that The Satellite would want to continue to work with the blog that has faithfully helped promote shows when that same venue is known as Spaceland. But so far we've heard nothing in response to our efforts to establish a relationship, and they appear to be using more mainstream blogs to get their message out. No hard feelings yet as the people over there are just getting started, but we cannot predict when it will get hard. We remind ourselves what counts is the bands, and no grudge can get in the way of that mission, so we will be there tonight to take in this seminal event. I’m not opposed to rock 'n’ roll, but I am opposed to the shows that were being picked, insofar as the grunge metal that doesn’t really appeal to me. Basically, we’re looking to book today’s top artists and the top artists of the past. We’re trying to get icons in here as well. Last time I checked, the Key Club was booking a whole lot of metal. Ignore us at your peril.